Sometimes a person takes promotion thinking it is a golden opportunity and the next logical step in a career, but after a while, it may become apparent that making the move wasn’t the best idea. In that case, asking for a voluntary demotion may be a viable option. However, voluntary demotions come with potential negatives like reductions in salaries and loss of stature within the organization. These and other drawbacks to voluntary demotions can be avoided if the following options are explored beforehand. If you are in a job where you do some things well and other things not so well, you may want to see if there are people on your team that have strengths where your weaknesses are. Perhaps you could trade a few of your responsibilities and thereby make the team more productive and individual team members happier. When you propose something like this, couch it in terms of benefit for the team and organization. This will show that you’re looking for a win-win situation for everyone rather than merely attempting to shed less desirable responsibilities. You can talk about the benefits for you, but that part of the conversation needs to happen after you discuss the impact to your team and organization. The conversation would be incomplete without addressing what brought the proposed change to your mind, but you must keep your audience in mind when you prepare for the conversation. It depends on the personalities within your team as to who to approach first. In many situations, it is best to approach your colleague first; however, your manager may want to be consulted before you bring up ideas about workload changes. When in doubt, talk to your manager first. If your organization has several positions you are qualified for, you may be able to request to be transferred to a vacant position that is classified at or below your current position’s classification. If government organizations allow this, they adopt strict rules to mitigate the possibility of an employee accusing the organization of discriminatory personnel practices. Defending against any claim of discrimination costs time and money, so leaders of government organizations want to do anything practical that will lower the risk of being sued. If you request a lateral transfer, chances are that you will be able to keep your salary. If you transfer into a position at the same pay grade, presumably you’d be doing the same level of work. If you transfer into a lower classified position, you may be able to keep your salary if it falls within the range of the new position. But again, all this is is subject to the organization’s rules governing transfers. A lateral transfer can be good for more people than just those considering a voluntary demotion. Gaining experience in a different part of the organization is beneficial for future promotional opportunities even if changing jobs doesn’t come with an immediate financial benefit. If you can’t find a position to transfer into, you might want to look at job postings. You can get out of your current job and likely receive a pay raise. And you may not have to leave your current employer. Some government organizations require a competitive hiring process for all vacancies. With these organizations, a voluntary demotion or lateral transfer may not be allowed. 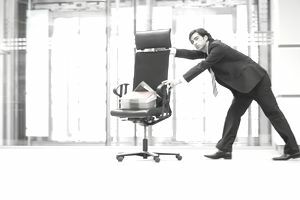 Like they do with transfer policies, organizations use the hiring process to reduce the likelihood that someone will sue the organization for unfair practices. Even if you do not get selected, going through the hiring process has other benefits. It helps you keep your resume up-to-date, sharpens your interview skills and allows you to meet new people.